Image: Deterding et al’s (2011) situating of gamification as being partially game-like and being more gaming than playing. Earlier this summer, I signed up for Coursera’s new gamification course, presented by Kevin Werbach of the Wharton School at the University of Pennsylvania. In this brief reflection, I consider what makes gamification ‘good’ or ‘bad’ for me. I’ve included links back to the videos I’m referring to here, but you’ll need to be registered with the course in order to view them. If you know me, you’re probably aware that I generally have a negative opinion of gamification, even though it can be easily and persuasively argued that my research examines how to gamify higher education. My negativity doesn’t stem from the use of game elements or game design techniques in non-game contexts in theory. It arises from the actual implementation. During Video 3.4: Tapping the Emotions, Werbach quotes early gamification adopter Mary Poppins, “In every job that must be done, there is an element of fun. You find the fun, and – SNAP – the job’s a game!” I think he’s right. Mary Poppins put her fictitious finger on the heart of the matter. If we’re finding and promoting the existing fun elements in a given activity, then I’m OK with that. If we’re adding fun where it didn’t actually exist, then that’s where I start to have problems. Video 3.2: Think Like a Game Designer explains how thinking like a game designer means you have two purposes: get your players player and then keep them playing. It goes on to explain that keeping them playing is not tricking them but genuinely engaging them. Again, I agree with this in theory. However, I find the practice is very much at odds with many businesses’ objectives and their subsequent implementation. I have issues when the emotions arising from fun, examined in Video 3.4: Tapping the Emotions, are used to manipulate people in a way that primarily or wholly benefits the company without actually providing genuine engagement or without making the game about the player as is suggested in Video 3.2 as being a key element. The temptation to monetize things means those making the decisions think of the players as ways to make to money. That’s what I usually think of when the term ‘gamification’ comes up and that’s the kind of gamification that leaves a bad taste in my mouth. What about yours? Does the term ‘gamification’ leave a bad taste in your mouth too? What are some examples of ‘good’ gamification in the Mary Poppins sense? What are some examples of ‘bad’ gamification? Can specific elements that make an example good or bad be articulated? Deterding, S. et al. (2011). 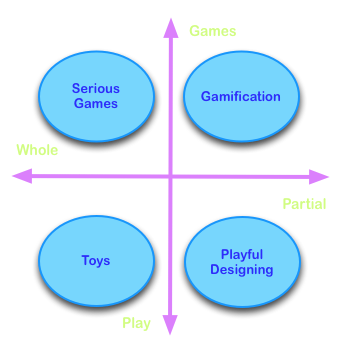 ‘From Game Design Elements to Gamefulness: Defining “Gamification”’. In: 15th International Academic MindTrek Conference: Envisioning Future Media Environments, September 28 – 30, 2011. New York, USA. ACM Press. pp:9-16. doi:10.1145/2181037.2181040. [Accessed September 7, 2012]. Just thinking if you’re able to play video games with one eye, as it takes a lot of focus and awareness,, mainly as a lot is occurring in the screen? imo, good gamification can be found for those applications that actually achieve their goal. i tried teaching a kid the importance of critical thinking but it was a bore to him. but then i got him machinarium. he learned a lot about logic and reasoning by playing machinarium on his ipad. he started loving maths later on. certain gamification focuses too much on enjoyment without attaining the goal. it’s considered bad. once, we were told to play world of warcraft to understand the design of the world physical elements ie rain, water etc. as u may have guessed it, we got so hooked up on the game and never really did the assignment. you know, you could use the REAL training elements here. please find the reference yourself as i’ve totally forgotten where i got it. Retention – how much of the skill can you remember? Enjoyment – how enjoyable and engaging is it? Application – can you apply what you’ve acquired? Learning – how much did you learn? a good gamification offers a balance between all the four elements. you end up enjoying what you learn. you can recall and apply it as needed. a bad gamification emphasizes too much on one element that it disrupts the rest. too much memorization, you get bored. too much fun, you are not serious about learning. too much application, you find it hard to do. too much learning, you find it too complex and intellectually draining.